I love olive oil cakes. Love them. With cornmeal/polenta, with citrus. They are so easy, no fussing with softening butter, melting butter, or having to turn a blind eye when you see how much butter is actually in the cake that you are about to make and then eat way too much of. Olive oil cakes are sophisticated. They are rustic and fruity and crumbly. 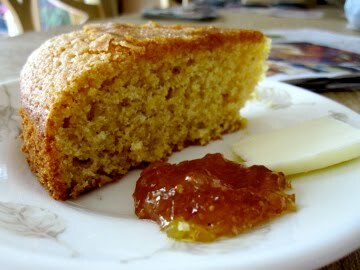 This Orange Cornmeal Cake is made with whole wheat pastry flour, which makes it a bit dense, but I like that. Last night I ate this cake spread with orange fig preserves while sipping the most scrumptious blood orange mandarin tea. 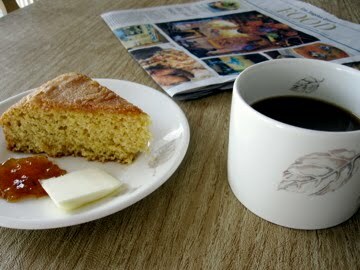 This morning I ate more cake with a cup of coffee while reading the newspaper. What a treat it is to read the actual newspaper than to stare at my computer screen and read the news online. 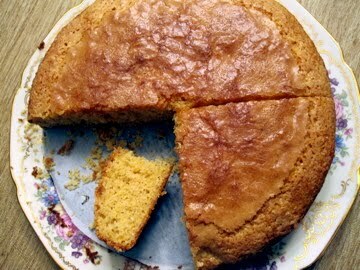 **NOTE: You can use extra virgin olive oil in this cake. It will be more fruity and flavorful (which I quite like) vs regular olive oil’s milder flavor. EVOO is also slightly more expensive. I struck a balance and used 1/4 cup of EVOO and 1/4 cup of canola oil. You can also use vegetable oil if you wish. Preheat oven to 375F and spray an 8-inch round cake pan (I used a spring-form pan) with nonstick spray. In a large bowl, whisk together eggs, oil, 3/4 cup sugar, orange juice and orange zest. In a small bowl, combine flour, cornmeal, baking powder and salt. Add dry ingredients to wet ingredients and whisk lightly until just combined. Pour batter into prepared pan and sprinkle evenly with remaining 2 tablespoons sugar. Bake for 30 minutes or until cake pulls away from sides and toothpick inserted in center comes out clean. Cool the cake in pan for 20 minutes. Run a knife around the edge and invert onto a plate. Re-invert cake onto a rack to cool completely. Serve with marmalade, and a warm drink. >It was indeed good with coffee!